It is pleasing to see the gardens recovering well after the prolonged drought this summer, giving a late burst of colour that should continue into October, if the promised warm autumn weather materialises. Dahlias, cosmos, begonias, zinnias and asters are looking especially good. But we have lost some shrubs and herbaceous perennials, which will have to be replaced. For the longer term, we aim to introduce more drought-tolerant species into the garden, to adapt to the changing climate. On the other hand, some plants have thrived this year. The golden rain trees were spectacular in July, covered in long bright yellow panicles and are now festooned with their unusual seed capsules. 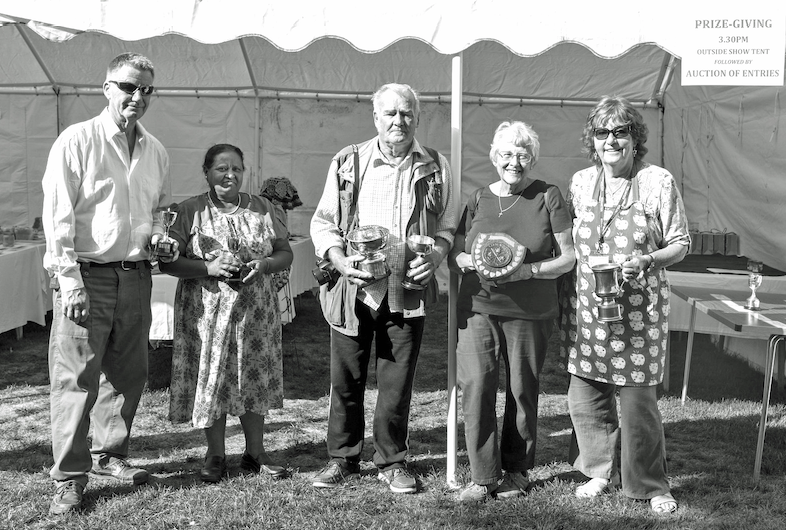 The mini-heatwave at the beginning of September coincided with our annual Horticultural Show, making for a great day. The main marquee was very colourful, showcasing the wonderful range of fruit, vegetables, flowers, cakes, preserves and handicrafts produced by local people. Well done to everyone who took part and thanks to our judges, stewards, volunteers and MC Teas for their part in the event. 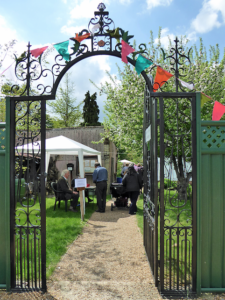 This year, we had more attractions to entertain visitors, including beekeeping, flower-arranging, a woodturner, bag-making, hand-made cards and machine-knitting, among others. 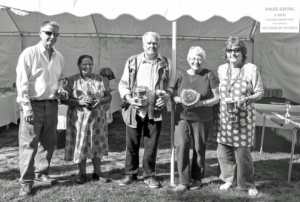 Congratulations to all the trophy winners: Kamla Wells (fruit and veg), Jean Osborne (best produce exhibit), Richard Steel (domestic classes), Rodney Peck (flowers), Audrey Jackson (handicrafts), Phoebe Marsh (8–12 year-olds) and Jake Smiles (7 and under). The Wells family again won the Chair’s Trophy for the highest number of points in the show yet – they take some beating! The best exhibit in show went to Rodney Peck for some stunning dahlias. Thanks also to Dr Tim Wreghitt for presenting the prizes. We are holding a new event on Sunday 21st October – Challis Apple Day – to coincide with National Apple Day. It aims to be a celebration of all things ‘apple’. The main activity is apple-pressing and juicing. We are grateful for a grant from SCDC’s Community Chest to purchase the necessary equipment. Please bring your own apples along to press and make juice, which will then be sterilised and bottled. For the children, story-teller Marion Leeper will be there telling stories from 11am to 2pm. There will also be other apple-themed children’s activities and seasonal soup from Andy’s kitchen. Our popular Halloween event – ‘Spooky Saturday’ – takes place on Saturday 27th October. All the usual children’s activities, refreshments and hot soup. Do come and enjoy this fun morning. Halloween costumes are not compulsory, but positively encouraged! Hope to see lots of you there. A large number of Challis volunteers enjoyed a visit to the RHS Hyde Hall garden in Essex, transported in Tim Phillips’ classic coach ‘Mary’. A very successful day for everyone, and a way of saying thanks to our fantastic volunteers for their time and input in the house and garden. I’m already thinking about possible venues for next year’s outing! Visitors to the garden in the coming month will notice scaffolding erected in the entrance from the High Street, as essential renovation work is carried out to our adjacent properties. This will not impede access. The gardens will be open at the usual times throughout this period. The last batch of Sawston History archives and artefacts have now been transferred to the Challis House from the Parish Council office. The museum and archive teams are making good progress on cataloguing this material before it goes into long-term storage. The museum and archive are open 10am to noon every Tuesday morning and on the first Saturday of each month, with stewards on hand to greet visitors and assist with any enquiries. Do drop in.